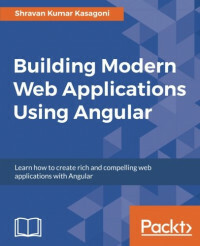 This book will you get you up and running with Angular and teach how to build modern web applications. It starts with basics of Angular 2 and then brushes you up with the new features of Angular 4. You will learn the core concepts involved in building web applications with Angular such as Data Binding, Routing, Dependency Injection, and much more. The book teaches how to build components and use them to build web apps of your choice. It will help you to handle different kinds of forms and learn the concept of reactive programming. Finally the book teaches how to build visually appealing and responsive UIs. Shravan Kumar Kasagoni is a developer, gadget freak, technology evangelist, mentor, blogger, and speaker living in Hyderabad. He has been passionate about computers and technology right from childhood. He holds a bachelors degree in computer science and engineering, and he is a Microsoft Certified Professional. He is a core member of Microsoft User Group Hyderabad, where he helps thousands of developers on modern web technologies and Microsoft technologies. He also actively contributes to open source community. He is a regular speaker at local user groups and conferences. Shravan has been awarded Microsoft's prestigious Most Valuable Professional award for past 6 years in a row for his expertise and community contributions in modern web technologies using ASP.NET and open source technologies. He is currently working with Novartis India, where he is responsible for the design and development of high-performance modern enterprise web applications and RESTful APIs. Previously, he was associated with Thomson Reuters and Pramati Technologies.